When your car doesn’t kick-start in the morning, it is not too big of an issue if the engine fails on Third Mainland Bridge, being stranded might be the biggest consequence. When a plane’s engine refuses to start the passengers might not just be annoyed, but might just worry what will happen if the engine fails mid-flight. So when the plane’s engine for Air Nigeria’s morning flight to Abuja refused to start, distressed passengers asked to get off the plane. The flight out of Murtala Muhammed Airport local airport (MM2), was slated to the leave at 7am in the morning but the pilot announced that there was not enough “ground power” to start the engines. The airline tried three ground power units to no avail. The Daily Times reported that Ismaila Umar was the first passenger to lodge his protest, and soon has a crowd of passengers backing his call to disembark. 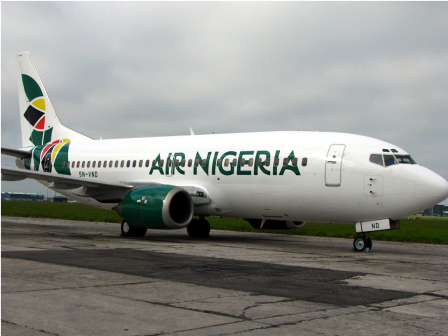 Air Nigeria tried to book them for the evening flight but there were parents flying to see their children during Parents’ Day at their boarding school, who protested. In the end, the passengers were refunded. Air travel in Nigeria has a particularly dingy reputation, with arbitrary flight cancellations, long delays, overbooked flights and poor customer service being frequent complaints of airline passengers, who are distrustful of the airlines, fearing that many put profit over passenger safety and comfort.